A recent study revealed that Florida is the worst state to be involved in a car accident. The study released by trusted financial advisor site WalletHub revealed that getting into a car wreck in the Sunshine State is going to cost you far more than anywhere else in the country. What makes this even worse is that your odds of being in a motor vehicles accident are also substantially higher throughout the state. 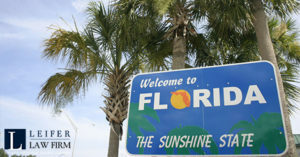 Florida ranks #20 on the list of states where you are most likely to be in a car crash and has some of the top car accident fatality rates in the nation, according to data from the National Highway Traffic Safety Administration (NHTSA) and the Federal Highway Administration. Not only are Florida residents more likely to be in a car accident, but the accident will cost substantially more than anywhere else in the U.S. There are several contributing factors. The WalletHub report explains that Florida has a higher than average percentage of uninsured drivers across the state. It ranks #2 for having the most uninsured drivers in the country. Even as many as 24 percent of Florida drivers – nearly a quarter of everyone on the road – have no auto insurance, according to the Insurance Information Institute. Those that are insured have the liberty of some of the most lax insurance requirements nationwide. Minimum insurance plans in the state, permissible by law, provide just $10,000 in personal injury protection (PIP) and $10,000 in property damage liability. However, insurance only pays 80 percent of medical expenses and 60 percent of lost wages within that $10,000 limit. Over half of Florida drivers have only the minimum required insurance plans. The high rates of uninsured drivers in tandem with these very low minimal insurance requirements for over 50 percent of insured drivers make car accidents a very expensive mistake for everyone involved, regardless of who is at fault. When you consider that the National Safety Council (NSC) reports the average cost of every non-fatal car accident injury at around $61,000, it is almost unimaginable how much financial distress one car accident can cause. Statistics from the Florida Department of Health show that the median cost for hospital admission alone is $42,000. Just a ride in an ambulance can reach well over $1,000. For the over 300,000 Florida residents who are involved in car accidents every year, the financial impact just adds insult to injury. These expenses – and the small fraction of which that is actually covered by insurance – don’t even touch damages to your wellbeing. The same NSC study measured how much your quality of life decreases after a car accident can financially drain you through a myriad of indirect losses. If you have been permanently disabled, it adds another $200,000 to your medical bills, while even a temporary injury costs an additional $50,000 in losses during your mental and emotional recovery time. Anyone who has been involved in a car accident knows just how traumatic the experience can be. Knowing that you already have so many odds stacked against you just by living in Florida is even more reason to protect yourself by getting the right legal help. If you have been in a car accident in Florida, it is highly advised to speak to an experienced local car accident attorney. It is overwhelming enough to be involved in a car accident. The last thing you need is the stress of battling it out with insurance companies, drowning in medical bills and feeling wronged. The car accident attorneys at Leifer Law Firm understand the laws in Florida and they know how insurance companies work. Call today.